Thank you for your interest in the National Electrical Contractors Association (NECA)! 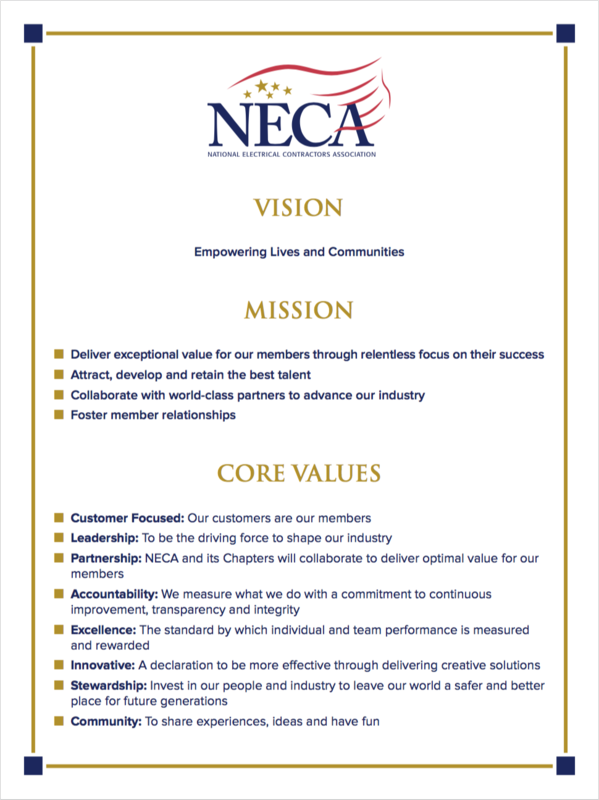 The following information will help to determine whether NECA membership is right for you. NECA is an extension of you. It’s that extra employee on your payroll who looks out for your interests. and business growth opportunities in the industry through meetings, peer counseling, and collaborative venues. Whether it’s lobbying on Capitol Hill, forming strategy partnerships, or labor negotiations, NECA members know through NECA, they have direct ways to influence the factors affecting their business. From education and industry research to marketing support, NECA helps both small and large electrical contractors find the solutions that help grow their businesses. NECA contractors have access to member services and benefits that saves their companies time and money, as well as technical expertise and exclusive industry research. NECA believes that it should take an active role in keeping its membership, the entire construction industry and the general public aware of the content and possible effects of legislation affecting the electrical contracting industry. NECA also ensures that the executive and legislative branches of the government are informed of the views of electrical contractors. NECA scrutinizes legislative affairs in such areas as bidding procedures, energy use and conservation, employment practices and taxation. NECA serves a watchdog role with respect to the rule-making activities of federal regulatory agencies, such as the Department of Labor, including OSHA, DOE and GSA. Lobbying is a high priority for NECA. They maintain a strong presence on Capitol Hill and often provide testimony on legislation and proposed rules that could affect the industry. NECA provides a full range of informational and educational services to help its members ensure the superiority of their work while taking advantage of emerging technology. NECA’s technical services not only benefit the member electrical contractor but also help set standards for quality throughout the entire industry. NECA keeps its members informed of technological developments affecting the electrical construction industry. NECA provides the tools and how-to instruction necessary to help members achieve excellence in electrical work. NECA equips its members to take profitable advantage of the new markets for their services opened by emerging technology. NECA chapters receive advance notice of new products and services, as well as guidance on effecting the best possible chapter management, with the NECA Chapter Alert. The Alert is published as needed to impart information of particular concern to the chapters, the field service and NECA’s leadership. NECA connects our members with the products and services that support their businesses. Check out exclusive NECA member value-added discounts offered by leading manufacturers and service providers in: PPE & apparel, office products, shipping, business development tools, car rentals and fleet maintenance & fuel, equipment rental, and industry publications. Attract new customers through NECA’s contractor search, the NECA Connection. The #1 Google hit to find an electrical contractor. The cost of membership in NECA is based upon a percentage of the member company’s gross electrical payroll. There are certain discounts and maximums for larger firms. The specific percentage is determined at the local level, generally these range between 1-2 percent. Membership in NECA begins with a local chapter, like us! You will need to complete a membership application. Upon approval, we will submit an application for your company’s membership at the national level. NECA membership is only available to a firm or corporation engaged in the business of electrical contracting, defined as the business of erecting, installing, repairing, servicing or maintaining electric wiring, devices or equipment.